The exam of the IBPS CLERK PRELIMS EXAM 2017 is still two days away for the last few batches who are going to attend the exam in the forthcoming days. So if you are in that batch of aspirants who are attending the IBPS CLERK PRELIMS EXAM 2017, practice is the vital key to develop the needed speed to attend the exam. You can learn the nuances of the new pattern coding and decoding questions from the one given below. We have also provided new pattern coding – decoding questions because anything can be asked in the exam. Coding and Decoding is the one topic that was asked in the IBPS CLERK PRELIMS EXAM 2017 and it was asked in certain batches and not for all the batches , so preparing for this question will enhance your preparations for the IBPS CLERK PRELIMS EXAM 2017. In the IBPS CLERK PRELIMS EXAM 2017 , you can expect 3 to 5 questions from this topic of Coding & Decoding (if it is asked in the slot). 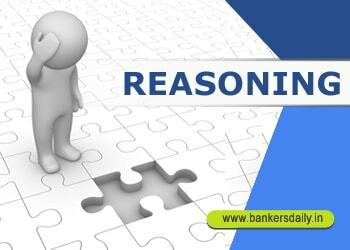 Not all the topics are asked in each slot and some of the topics appear distinct and puzzle and seating arrangement questions find a steady place in the reasoning section and coding and decoding occasionally. But this will be easy to solve and to grab the marks easily. Q.1-5) Study the following information carefully and answer the given questions. Q.1) What is the code for the word ‘Right’? Q.2) Which of the following word is coded as ‘na’? Q.3) What is the code for the word ‘Important’? Q.4) Which of the following word is coded as ‘ma’? Q.5) What is the code for ‘Nothing important right’? Q6. In the given code language, what does the code ‘lo’ stand for? Q7. What is the code for ‘nothing’ in the given code language? Q8. 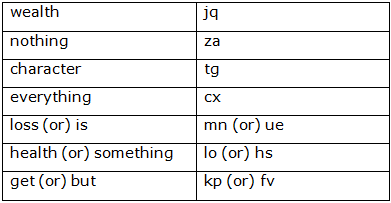 What is the code for ‘loss’ in the given code language? Q9. What is the code for ‘tg’ in the given code language? Q10. What may be the possible code for ‘fvueza’ in the given code language? You can also check one more question set regarding the Coding and Decoding from the post that is give below.